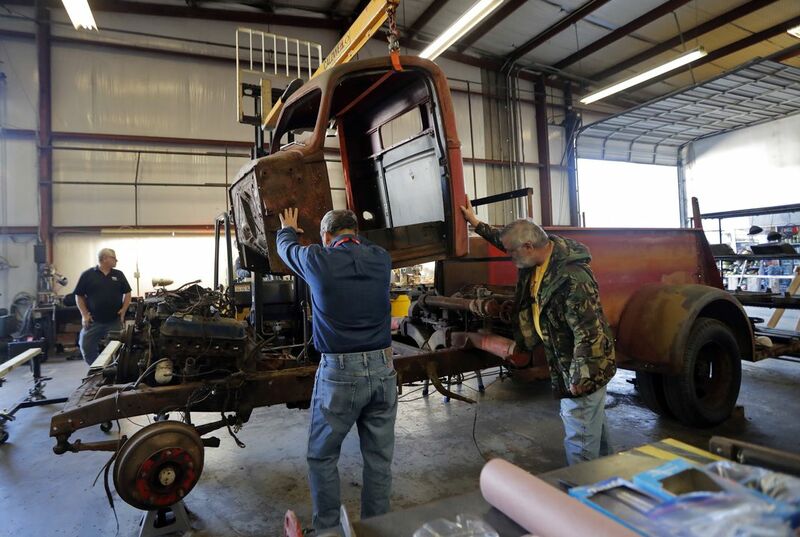 The National World War II Museum is taking apart a fire engine made for the military home front in 1943, and expects to have it rolling and ready for display in two or three years. When the 25-foot-long Ford-American LaFrance fire truck was new, it would have carried four firefighters. Two of them would stand on the rear running board. Steve Owen of Pell City, Alabama, donated it in 2009. "I can't tell you how happy I am to know they're restoring it," he said Wednesday. It's currently a weathered red, with bits of earlier paint jobs showing through, but will be repainted olive drab. That's the color all U.S. military fire trucks were painted after the Japanese bombed Pearl Harbor on Dec. 7, 1941, said Tom Czekanski, the museum's restoration manager. He said that color change was ordered because the red fire trucks were bombed first. Honolulu's civilian firefighters responded. The museum hasn't been able to learn where its truck, made in 1943, served during World War II. It was certainly military because that was the only reason for which vehicles could be made during the war, Czekanski said. He believes it was used at an Army base in Alabama. Owen, whose father was a firefighter, spotted the truck sitting in front of the Dallas-Selfville Volunteer Fire Department in Trafford, Alabama, in 1984 or 1985. It had a "for sale" sign. "I turned around and I bought it on the spot," he said. He can't recall the cost. "It wasn't a terrible big amount or I wouldn't have bought it," he said. "I sure enjoyed it. It had the sound and the smell of the fire trucks that I remember riding in when I was a little kid. You weren't supposed to ride around on the truck, but I'd sit on top of the fire hoses and they'd cover me up with a tarp, because I loved to ride in those things," Owen recalled. "I kept it running for several years and I would take kids around on it," he said. "Then I let it set up too long in the yard and it got run down." Owen said he'd been thinking about donating it when Pell City mailed him a notice to get the truck running or get it out of his yard. "That was the kick in the pants I needed," Owen said. 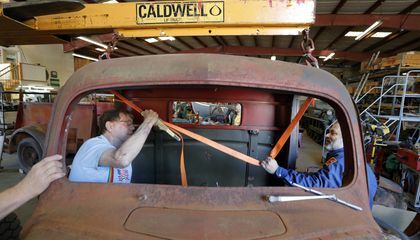 A flatbed hauled the truck to a warehouse a few blocks from the museum — its current restoration headquarters. Work began in January. Nearly every piece will be unbolted, inspected and repaired if necessary. Then every piece will be cleaned, repainted and put in working order. The seats’ vinyl covers are in great shape but the springs partly filled with what probably were mouse nests. They lean against the front of an aircraft tractor. Large parts are shelved or — like the fenders and pieces of the hood — piled on the warehouse floor; smaller ones are in labeled Zip-Loc bags. The engine is still on the chassis, but was replaced at some point with a model other than the original, so the museum is looking for the right model. It's a lot of work, but worth it. "We were intrigued," Czekanski said, "at the idea of a vehicle used on the home front during World War II." What process will the museum use to get the fire truck in working order?